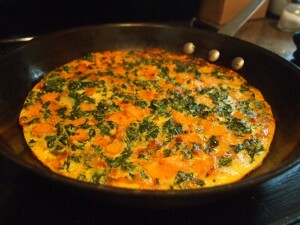 Sweet Potato and Kale Tortilla fresh from the oven. Tortillas in Peru, as in much of the Spanish speaking world, are dishes similar to frittatas and omelets. We first served this recipe at our 2012 Very Veggie SXSW Brunch to feature ingredients that are seasonal and widely available this time of year in Austin. We suggest serving this tortilla with a spicy Peruian style Aji. Heat the vegetable oil in a large 100% oven proof skillet over medium heat. Add onion to the skillet and saute until translucent, 2 to 3 minutes. Add garlic and sweet potato to the skillet and cook until the potatoes are slightly crispy, about 5 minutes. Add chopped kale to the skillet and continue to saute until the kale is bright green and slightly wilted. While the vegetables are cooking combine the eggs, milk, salt, and pepper in a medium bowl and whisk until thoroughly blended. Pour the egg mixture over the cooked vegetables and, without stirring, allow to cook on medium-low heat until the eggs have almost set, about 5 minutes. To finish cooking the tortilla transfer the skillet to a preheated oven and broil on high (500 degrees Fahrenheit) until the top is golden brown. Remove the skillet from the oven and run a silicone spatula around the edge of the pan to remove the tortilla from the pan. Serve warm with your favorite aji.